This event will be held at the Fisher Center for the Performing Arts, Bard College NY. 845-758-7900 Author Neil Gaiman and celebrated cartoonist Art Spiegelman (Putlitzer Prize for Maus) talk about cartooning, writing, working across artistic mediums, friendship, identity, and more. Chicago premiere, this innovative show combines slides, talk, film, and live musical performance. Spiegelman collaborated with acclaimed jazz composer Phillip Johnston whose sextet underscores the multimedia presentation with new original music. Wordless brings to life the work of the five most important artists of the wordless novel – Frans Masereel, Lynd Ward, Milt Gross, Otto Nückel, and Si Lewen – in a series of animated projections.The program also contains new original work created by Spiegelman, as well asanimating and musicalizing some of his older short wordless strips. This event, organized by the Logan Center in partnership with UChicago professor Hillary Chute, is part of the first performance tour of Wordless!, following stops at the Sydney Opera House and New York City’s BAM. The Sydney Opera House commissioned the new work for its fall festival, GRAPHIC, where Wordless! premiered October 5, 2013. Art Spiegelman and Phillip Johnston’s Wordless! is presented by the Logan Center and made possible by the generous support of UChicago Arts, the University of Chicago’s Humanities Division Visiting Committee, The Adelyn Russell Bogert Fund of the Franke Institute for the Humanities, Arts Council, the Karla Scherer Center for the Study of American Culture, Critical Inquiry, the Chicago Center for Jewish Studies, and the Gray Center for Arts and Inquiry. Additional support provided by the Departments of Art History, Cinema and Media Studies, English Language and Literature, Music, and Visual Arts. NewCity is the official media sponsor. Wednesday, September 18, 7:30 PM A Brooklyn Book Festival Bookend Event Book Launch: Art Spiegelman presents Co-Mix: A Retrospective of Comics, Graphics, and Scraps Greenlight is exceedingly proud to host Art Spiegelman, the only cartoonist to win a Pulitzer for his work, for the bookstore launch of his new book Co-Mix: A Retrospective of Comics, Graphics, and Scraps. Spiegelman has been a leader of, and an inspiration for, alternative comics artists throughout the past three decades, long before Raw magazine and Maus. In Co-Mix, readers will be able to trace the evolution of this multifaceted artist through gorgeous full-page reproductions of Spiegelman’s artwork and essays by critics J. Hoberman and Robert Storr. Spiegelman presents a talk and slideshow about his work and signs copies of Co-Mix for fans at this special launch event. Please note: Art Spiegelman will sign unlimited copies of Co-Mix, and up to one other item per person. Customers must purchase Co-Mix at Greenlight in order to join the signing line. Art Spiegelman promotes A sombra das torres ausentes. Art Spiegelman, Breakdowns: Portrait of the Artist as a Young %@&*!. Art Spiegelman , Breakdowns: Portrait of the Artist as a Young %@&*!. Amazing graphic artist Art Spiegelman has set the precedent for graphic artists everywhere; using intelligence, talent, and literary whit to speak to social commentary and truly expand the world of story telling as we know it. He has been a contributing editor and cover artist for "The New Yorker" since 1992. 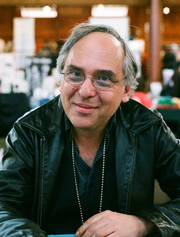 Art Spiegelman has received The National Book Critics Circle nomination in both 1986 and 1991, the Guggenheim fellowship in 1990, and a special Pulitzer Prize in 1992. His art has been shown in museums and gallery shows in the United States and abroad, including a 1991 show at the Museum of Modern Art in New York City . Breakdowns, his newest book, opens with vignettes of the people, events, and comics that shaped Art Spiegelman. It traces the artist’s evolution from a MAD-comics obsessed boy in Rego Park , Queens, to a neurotic adult examining the effect of his parents’ memories of Auschwitz on his own son. The creator of the Pulitzer Prize-winning "Maus" explores the comics form…and how that form has formed him. This illustrated essay looks back at the 1960s as the artist pushes 60, and explains the obsessions that brought his works into being. Poignant, funny, complex and innovative, Breakdown alters the terms of what can be accomplished in a memoir. Art Spiegelman discusses & signs Breakdowns: Portrait of the Artist as a Young %@&*! Art Spiegelman is currently considered a "single author." If one or more works are by a distinct, homonymous authors, go ahead and split the author. Art Spiegelman is composed of 11 names. You can examine and separate out names.